Already last season, vinyl has been one of the favorite materials seen on many fashionistas and streetstyles. This spring and summer, the vinyl trend takes us even one step further. Instead of black vinyl pants, we will see lots of colored plastic and see-through fabrics. Of course, this trend can be picked up in many ways and you don’t need to show your trend knowledge by wearing head-to-toe plastic combinations. 😉 You can easily subtly pick up the trend by choosing a plastic bag or shoes with some vinyl elements. Apart from that, a see-through rain coat is not only stylish but also pretty functional. (Another side note on that: for people like me, who like to spill stuff over their clothes, this trend is more than welcome as you can easily swipe off everything. 😉 lol ). So in today’s look, I chose a more basic combo to let the plastic bag speak for itself. 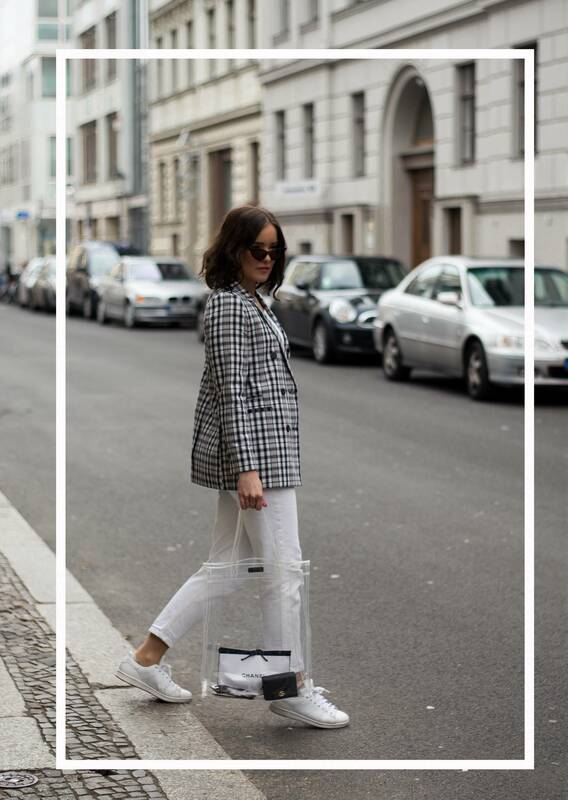 The white mom jeans and checked blazer have been one of my best buys this spring. Apart from that, I stole these retro sunglasses from Anduka (who also took today’s photos ♥) and they already became one of my Favs. And last but not least, I think the whole point of plastic bags is to show the content of your bag – but in a beautiful way. So basically, it’s like a “flatlay to go”. 🙂 (Or how my boyfriend would put it: the airport bag – as there is no need to control the bag anymore 😉 lol). 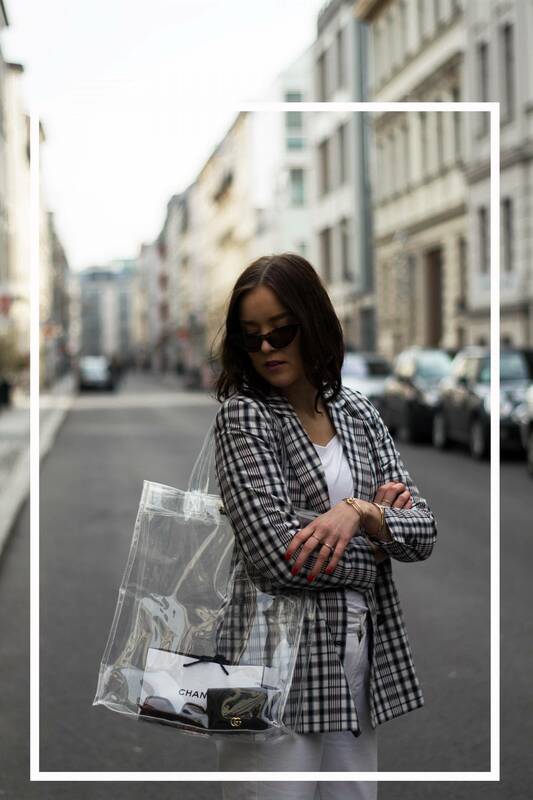 And I became quite obsessed with the many different ways that this see-through bag can be styled. Either with some designer bags, purses or clutches or add some fruits and flowers for a more romantic approach – there are sooo many different ways of styling it! That’s quite a chic bag. Du meisterst den See-through Trend wirklich wunderbar! Ich finde die Tasche inkl. Inhalt 😉 auch sehr schön kombiniert mit dem klassischen Look! 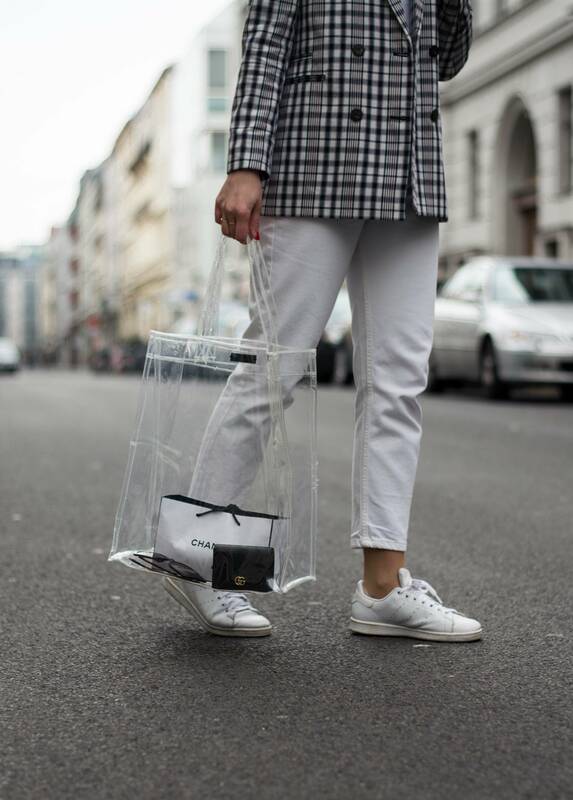 Letztens habe ich auch erst über die Clear bags einen Artikel veröffentlicht und muss sagen, dass ich seitdem echt in LOVE bin. Noch bin ich auf der Suche nach der richtigen Tasche, die meinem Geldbeutel entspricht aber ich werde mir definitiv auch noch eine zulegen. That’s quite a fun and unique bag. Makes everything easy to find inside the bag! I prefer the privacy of the traditional though. Anyway, your checkered blazer looks absolutely pretty. Dein Style ist einfach toll! Ich finde die Tasche tatsächlich auch sehr toll und als ich sie bei dir gesehen habe, dachte ich mir, dass sie auch was für mich wäre. Mal schauen, ob ich sie mir noch zulege. Auch diese transparenten Regenjacken habe ich schon gesehen und finde sie super! Nächste Woche ist wieder schlechtes Wetter angesagt – das wäre die perfekt Gelegenheit. Super Mega toll! Was ich so herrlich finde ist, dass Transparenz und all das aus meiner Kindheit stammt. Ich hatte eine Puma-Tasche, grünes PVC. Jeden Tag fuhr ich damit zur Schule (mit 17/18) bis irgendwann eine Wasserflasche explodierte und sich die Tasche in ein Aquarium verwandelte. Was für Erinnerungen!!! was für ein cooler eeffekt durch die Tasche meine Liebe!